The Mars 160 mission entered into simulation on July 20, 2017. It has since had a busy week in the Arctic with its six crew members carrying out their science and research goals for the mission. Mars 160 is a two-phase Mars analog mission sponsored by the Mars Society. 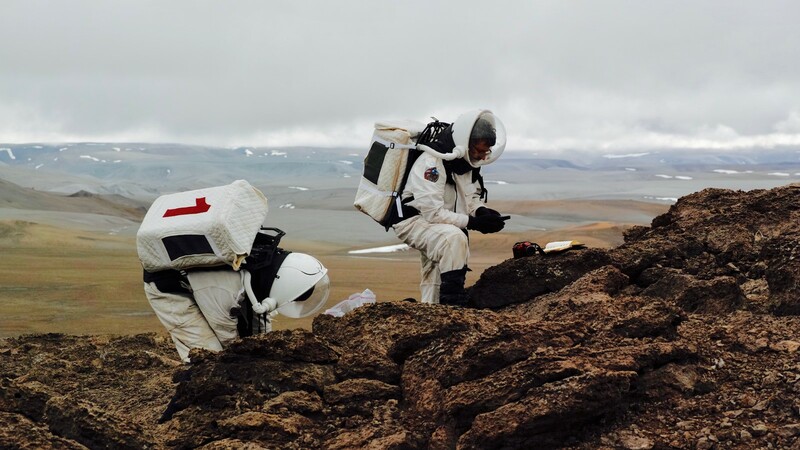 The goal of the Mars Society-organized mission is to understand the differences in science return and crew dynamics between its two analog research facilities – the Mars Desert Research Station (MDRS) in Utah and the Flashline Mars Arctic Research Station (FMARS) on Devon Island in Canada. The current and final phase of the mission was “launched” on June 22, 2017, when the crew met in Yellowknife, Canada, to make final preparations to travel to FMARS. The start of simulation was delayed by nearly three weeks as melting snow and inclement weather prohibited landing on Devon Island until July 15. In spite of this, the crew remains optimistic about completing critical tasks for the mission. After spending the first few days at FMARS deep-cleaning the habitat, the crew chose July 20 as the first day to enter simulation, coinciding with Space Day in the United States and marking the anniversaries of the Apollo 11 and Viking 1 missions landing on the Moon and Mars, respectively. One simulation began, science tasks began in earnest. On July 20, crew members performed a short extravehicular activity (EVA) near the habitat to test out the station’s simulation spacesuits and for the crew to become more familiar with the area. Inclement weather has continued to plague the mission but has not prohibited the execution of “out of sim” EVAs being conducted without spacesuits. Rain is something spacesuits designed for the cold and dry environment of the Mars-like Devon Island do not handle well. It poses a major safety risk when wearing the spacesuits as water and fogging of the face shields can render visibility to near nothing in a short period of time. Crew members on EVA have worn plenty of rain and cold weather gear to make an appropriate substitution in terms of the limiting mobility spacesuits normally impose. Unlike previous missions to FMARS and MDRS, science return is a driving force behind the Mars 160 mission. 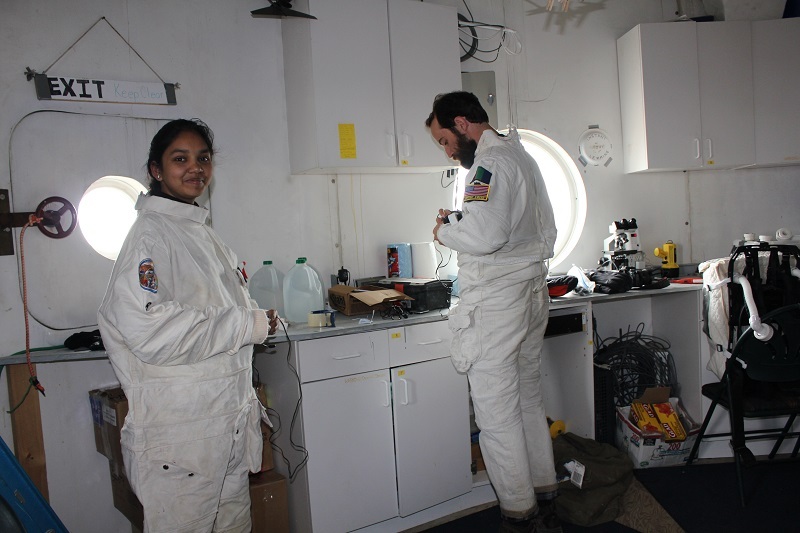 In the case of out of sim EVAs, science productivity is factored in and compared with “in sim” EVAs where spacesuits are worn as if the researchers were actually on Mars. From July 20 to 27, seven EVAs were performed: three were conducted out of sim due to rain, and the remaining were performed in sim wearing the spacesuits. The first four EVAs were predominantly for the purpose of scouting the area near FMARS to give the crew a better feel for the region, and the remaining three EVAs during the week were spent carrying out field research tasks. These tasks included geological and biological sampling as well as testing different imaging systems to document the area. The crew is adapting to life in the confined quarters of FMARS. The 25-foot (7.6-meter) diameter, two-story habitat has taken on the atmosphere of a busy household around a major holiday. A multitude of tasks are usually being carried out at any given time, from cooking to habitat maintenance as well as laboratory tasks in support of field activities. The smell of fresh-baked bread often fills the habitat, a near daily project thanks to Anastasiya Stepanova locating a new bread maker in the attic of FMARS. Stepanova has also supplied the crew with an assortment of Russian space food meals, courtesy of Moscow-based Spacefood Laboratories. Spacefood Laboratories has been supplying food for the Russian space program since the 1950s. It has recently expanded its market to other customers ranging from outdoor enthusiasts to rescue crews in remote areas. 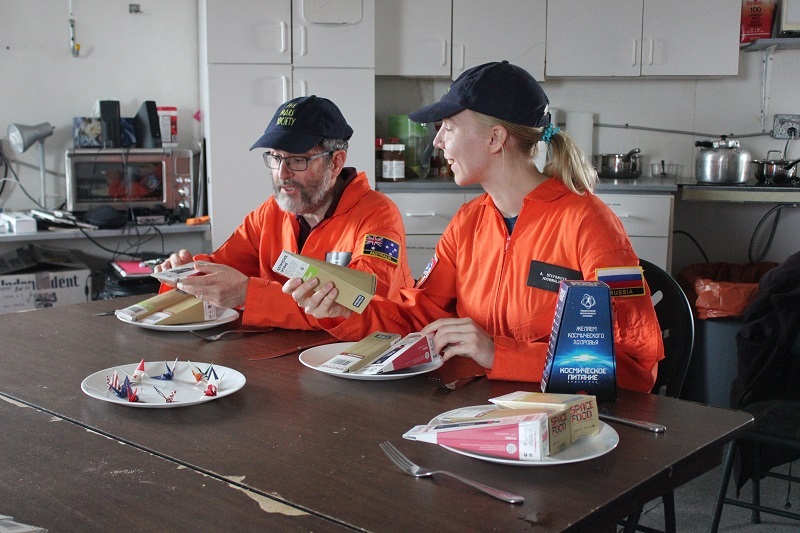 The twice-weekly Russian space meals are eagerly anticipated by the Mars 160 crew and input into meal selection. Having a variety of food choices will help with planning the menu for future long-duration missions. As the crew looks ahead to its second week of the simulation, a full schedule of EVAs is planned in order to carry out several of the geological, biological, and human factors studies that are the primary goals of this phase of the mission. During the week, the weather is expected to clear, providing conditions favorable for more in-sim EVAs with the spacesuits. Drier conditions will also favor EVA’s to points of interest further from FMARS.